A classic Strawberry Tart recipe using summer’s finest juiciest fruits with a creme patissiere & homemade strawberry glaze – delicious! Strawberries are the best of summer fruits. Nothing beats the pleasure of picking strawberries on a warm sunny day and popping them into your mouth, still warm and juicy with a flavour so sweet and so intense. Sadly neglected because of my knee operations, our strawberry plots have gone awry over the last couple of years and I haven’t been able to rescue the overgrown plots in our fruit garden. I’m saving what plants I can this year and 0H has promised me some raised beds for next year, so watch this space. 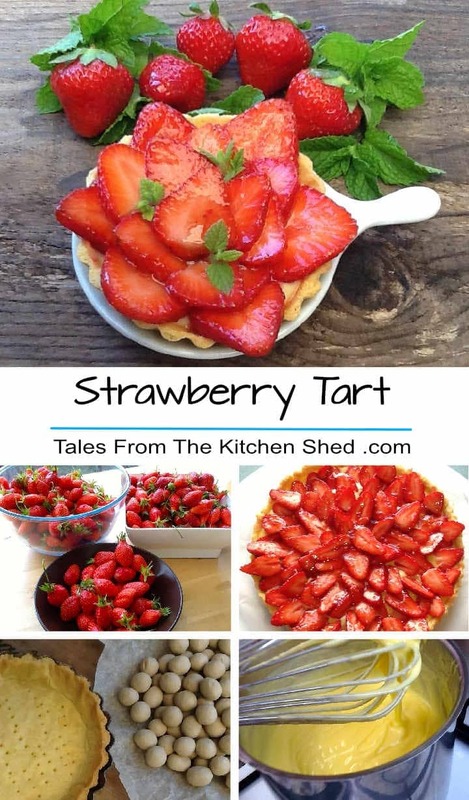 Our favourite strawberry dessert here at the Kitchen Shed is a Tarte aux Fraise, the traditional kind with a rich shortcrust pastry, a creme patissiere, the ripest fresh strawberries you can find and a glaze. When I have time, I like to make individual strawberry tartlets as there’s something I find so cute and delicious about them. 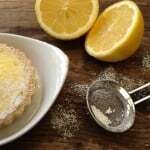 This recipe gives instructions and timings for both a large tart and small tartlets – I did the same with my Easy Lemon Tart and it proved to be quite popular. 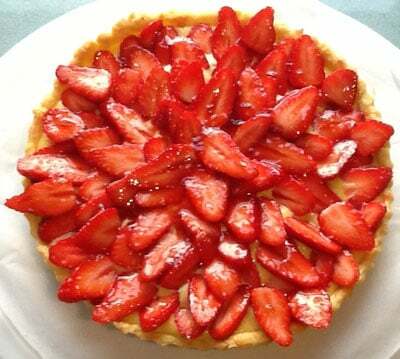 The Strawberry Tart is relatively easy to master and both the pastry case and custard can be made beforehand; the availability of good quality ready made tart cases and custards makes the recipe even easier. Once you have your tart case and custard it’s simply a matter of filling the pastry case with custard, topping with strawberries and brushing with a glaze. We’re down to the last jar of our homemade strawberry jelly from a batch I made just for strawberry tarts – take a look at the Strawberry Jelly recipe for details if you want to make your own too. If you don’t fancy making a glaze to top off your tart, you can simply dredge with icing sugar instead which means making your strawberry tart really can be as easy as pie. Bon appetit. 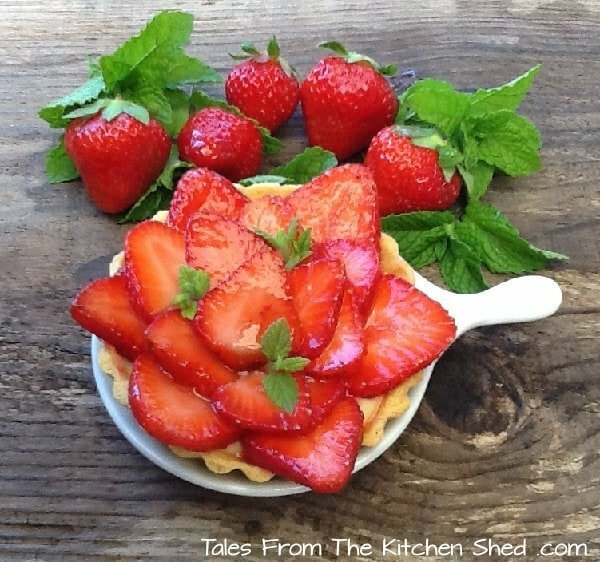 A classic Strawberry Tart recipe using summer's finest juiciest fruits with a creme patissiere & homemade strawberry glaze - delicious! 4 tablespoons strawberry jelly or warmed and sieved strawberry jam. Alternatively, 2 to 3 tablespoons of icing sugar for dredging. Whisk egg yolks and sugar until light and thick, then stir in the cornflour. Slowly bring milk to the boil. Remove from the heat and pour onto the egg mix, whisking all the time. Transfer your custard to your milk pan and continue whisking over low to medium heat until it comes up to a gentle boil, it must boil to thicken. Continue to whisk for 2 minutes or until thickened. Remove from heat and add the vanilla extract. 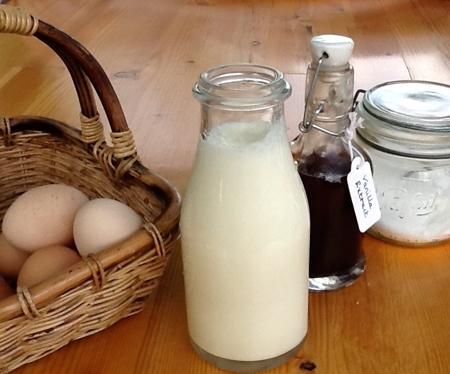 Transfer to a bowl or jug and dredge with icing sugar to prevent skin forming. Cover with cling film and pop in the fridge as soon as the custard is cool enough. Leave in the fridge until quite cold. Sift flour and salt into the mixing bowl of the stand mixer. Add cubes of butter and mix on slow with a paddle attachment until the mixture resembles fine breadcrumbs. Add the icing sugar and briefly mix. Briefly whisk egg yolk and water in a small bowl before adding to the pastry mix. Mix on slow until the pastry forms. This shouldn’t take long at all, less than a minute – you don’t want to overwork the pastry. Grease 1 x 23 cm ( 9 inch ) loose bottomed flan tin or 8 x 9 cm ( 3 ½ inch ) individual tart tins. Preheat oven to 200℃ / 400℉ / Gas Mark 6. Pop the back in the oven for 10 minutes (large tart) or 6 to 8 minutes (individual tarts) to crisp up the bottom. Give the creme patissiere a good whisk before spooning it into the baked pastry case and smooth the surface. Arrange the strawberries slices on top in circles, starting from the outside edge and working into the centre. Heat the strawberry jelly or sieved jam and brush over the strawberries to glaze or if you prefer, dredge with the icing sugar. Buy a ready made pastry case, a pot of ready made custard, a pack of strawberries & simply assemble. Treat Petite created by Stuart at CakeyBoi & Kat at The Baking Explorer, the host for June is Stuart over at CakeyBoi . Wow – this is so beautiful! What a great way to use summer’s strawberry bounty! I love it! Thanks Nicole, I love the summer fruit and strawberries make the best summer tart. Oh man this sounds amazing, and I am so feeling the custard on the bottom with the berries on top! The pictures really do it justice, I am craving this now. Strawberries are in season and this is exactly what I plan on doing with them. Thanks for sharing! I can’t wait for fresh berry season. It has been a cold and rainy season, so who knows when they will be ready. Once they are….I need to give this delicious dessert a try. I am such a strawberry fan. When I was a little girl my grandmother once bought me an entire flat for myself to see if I would finally tire of them. I did not! 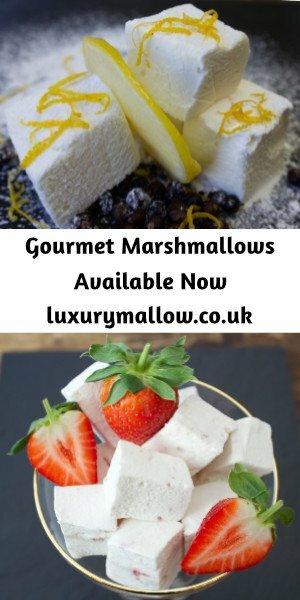 And these are such a pretty, simple, elegant dessert! It looks beautiful! The strawberries are so good at the moment and I’m planning to go and pick some today with my little boy. We all like them so much I hardly ever actually make anything with them though! Perfect for this time of the year ! Simple, elegant and a crowd pleaser for sure this one! Yum! These look so fresh I can almost taste them. Thanks for tartletting them up and entering them into Treat Petite! I love strawberry tarts and this looks delicious. Great idea to give instructions for large and small tarts. I prefer to make small as I’m terrible at slicing large tarts neatly! 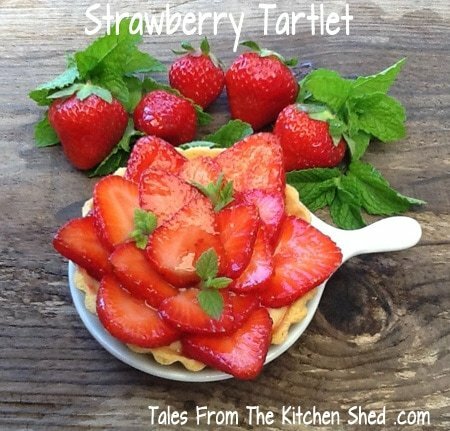 What’s the texture of the strawberry jelly like on the top of the tart. I’ve tried warmed jam before and I found it sticky rather than jelly-like. I remember eating strawberry tarts from a patisserie and it was definitely more jelly-like, but I’ve no idea how to recreate it. Thanks Charlotte. I’m terrible at slicing tarts too, I usually rope someone else in to do that for me. The strawberry jelly isn’t as sticky as jam, it’s similar to a redcurrant jelly but not as thick a set. I love the tarts from a patisserie, perhaps they use something similar to gelatine in the jelly, I’m not sure.